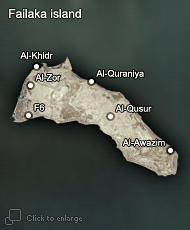 The Late Pre-Islamic to Early Islamic Period village at Al-Qusur, situated in the middle of Failaka island was first recorded by aerial prospection in 1960. It was excavated in the mid 1970s by an Italian team and in the late 1980s by the Kuwaiti-French and French missions. According to the results of these missions, it is possible to say that the centre of the site was a monastery with a church surrounded by a densely settled area. In its broader surroundings a large village was located. Over 140 settlement units can be found at Al-Qusur. The scientific programme of the Kuwaiti-Slovak Archaeological Mission began in February 2006. Apart from field walking and excavation, DEMP and GPR geophysical techniques were employed at the site. Up-to-now only the western and very southern section of the site was mapped by KSAM. In total 71 settlement units, together with several simpler structures, were documented. Nine units (1, 4, 26, 27, 28, 38, 39, 40, and 41, according to Slovak numbering) were prospected in detail with the main goal to obtain datable material and more information about the ground plans of the farmsteads. On the basis of field observations and recorded data some of the settlement units were tentatively 3D modelled by computer. As for the finds, the most spectacular in the complex from Al-Qusur during the 2006 ­- 2008 field work were fragments of stamped pottery, thin walled glass vessels with relief decoration and collection of semi-precious stones of purple colour. Pieta, K. – Shehab, S. A. H. – Tirpák, J. – Bielich, M. – Bartík, M. – Ďuriš, J.: Archaeological and geophysical prospecting of deserted Early Islamic village Al-Qusur (Failaka Island, State of Kuwait). Študijné zvesti Archeologického ústavu SAV 41, 2007, 74–76.